Last month on the 19th you entered one of your yearly personal pleasure peaks. The pleasures of the senses pursue you and you can indulge. It is also a good time for getting the body and image in shape, the way you would like them to be. You have more personal control over the body this period and this helps. Personal pleasure is strong until February 18. You look good, you dress well and have more personal charisma - that invisible something that is the essence behind all beauty. As we mentioned, you are still in a powerful period for launching new projects or ventures. ALL the planets are moving forward until the 18th (highly unusually). So you have a rare window to launch that new venture. The 10th to the 18th is best for this, but the 18th to the 25th is a good second choice. 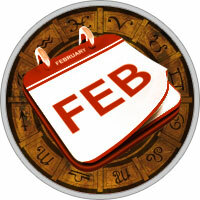 Last month also on the 19th, the planetary power began to shift from the upper half to the lower half of your Horoscope. This shift gets even stronger after the 2nd as Venus moves below the horizon of your chart. It is time to de-emphasize the career and focus on the home, family and emotional wellbeing; time to build up the forces for your next career surge, which will happen in six months or so. These pauses are very healthy. It is like a good night's sleep. The body is still. Outer world objectives are left behind. The forces are built up to handle the next day. The person who deprives him or herself of sleep will not function well the next day. Of course, you still handle the basic needs of the career - you don't completely abandon it - but you shift attention to the home and the emotional life. On the 18th you enter one of your yearly financial peaks. Your prosperity will be even greater in July (and after) but this month is excellent too. Your money house is easily the most powerful in the Horoscope this February, with 50 and sometimes 60 per cent of the planets either there or moving through there. The financial intuition is very good. Your gut instincts are good. You have a lot of help, a lot of financial favour, from friends, from the current love, neighbours, foreigners and foreign companies. The money is rolling in. The gates of heaven have opened and there is a down pour­ing of wealth. It comes in many ways and through many people. Enjoy! With these kinds of aspects wild and wonder­ful things start to happen. You might invoice someone for an amount and they send you twice that and tell you to keep the change. You might ask the beloved for something and he or she gives you double what you asked for. Aquarians are rational, logical people, but after the 18th this strength that you have doesn't seem to matter. The Water element gets very powerful. People are feeling oriented and they go with the mood of the moment. Logic doesn't sway them, but if you can appeal to their feelings -to their imagination - you will connect. Keep in mind that people are hypersensitive this month. Watch your words, your body language and facial expressions. People overreact to these things now.